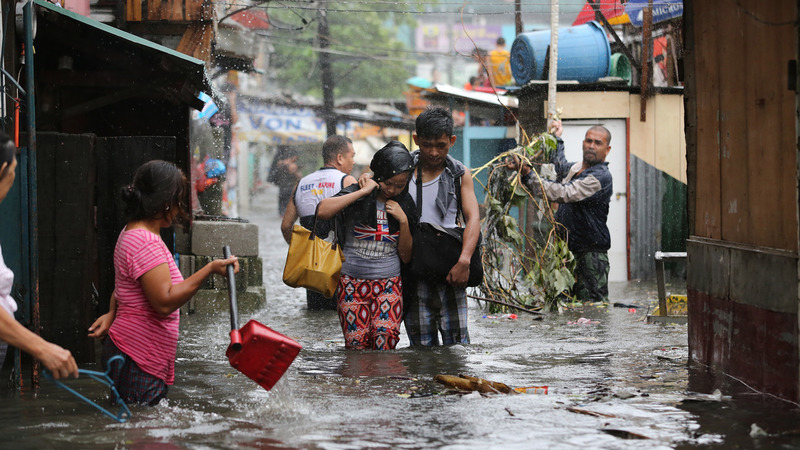 A Dozen People Killed As Typhoon Batters The Philippines : The Two-Way Mass evacuations helped limit the death toll from Rammasun as it passed through densely populated areas. The government was better prepared following a killer storm last fall. At least a dozen people were killed as the Philippines was battered by its first typhoon of the season on Wednesday. Since the storm passed through major population centers, officials were relieved that the death toll wasn't higher. The storm, known as Rammasun but called Glenda locally, sideswiped Manila but knocked out power there and across Luzon, the most populous island of the archipelago. "I am happily surprised because of the minimal casualties and damage," Public Works and Highway Secretary Rogelio Singson told Reuters, noting that 17 million people lived in the typhoon's path. Singson said that the government was better prepared after the devastation caused by Haiyan, the "super typhoon" that killed more than 6,000 people and left more than 1,000 missing last November. "It was like a drill," Manila Mayor Joseph Estrada told The Associated Press. "We hauled people away from dangerous seaside areas, whether they liked it or not." More than 370,000 people had been evacuated before the typhoon made landfall, mostly in the eastern province of Albay. The wind toppled utility poles and ripped roofs off houses. More than half of Luzon is without power, according to the BBC. The typhoon, which had gusts of up to 115 mph, weakened before blowing out of the country, heading toward China's Hainan Island and Vietnam. It could regain strength while crossing the South China Sea. The Australian Broadcasting Corp. has published a gallery of photos and videos tweeted by eyewitnesses.